Am gestrigen 15. 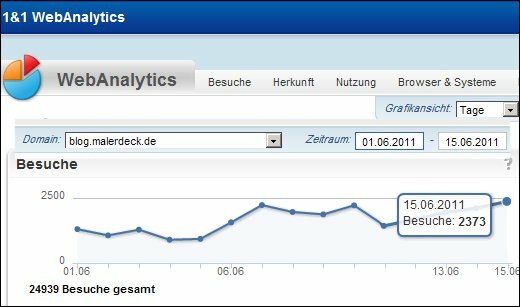 Juni, konnte ich einen neuen Tagesrekord auf dem Blog registrieren: 2.373 Klicks/Besucher! Vielen Dank an alle Blog-Leserinnen und Leser. This entry was posted on Donnerstag, Juni 16th, 2011 at 10:28 and is filed under Twitter, Facebook & Co. Social Media. You can follow any responses to this entry through the RSS 2.0 feed. Both comments and pings are currently closed.